When journeying across the myriad lands of Schön, you will certainly encounter a variety of folk—the slight and the tall, the overt and the subtle. Her people produce a spectrum of colors, shapes, and sizes, clothed in a wide variety of styles and hues and uttering the assorted dialects of numerous languages. They represent many races, from the wildling sprites and stoic dwarves to majestic elves, mingling among a variety of human ethnicities. In the beginning, the One True God, Adonai, created the world and the peoples who dwell and reign on and in and over it. To the Elves He gave the Feywild, to the Dwarves He gave the Underworld, and to Man He gave the Mortal Lands. While humans—often called the race of Man—are the most common people Schön, there are many species of intelligent creatures which you might play. While not every intelligent species is appropriate for a player-character, dwarves, elves, and humans certainly are, and these races make up the typical adventuring party. Also appropriate are gnomes, sprites, and half-elves, though these are much less common. Your choice of race affects not only statistical and mechanical aspects of your character but cultural as well. When selecting a race, consider the kind of character you want to play. For example, an elf could be a good choice for a stealthy ranger or a powerful wizard, while a dwarf makes for an excellent heavily armored warrior. Your character's race not only affects his ability scores and traits but also provides the prompts for building his story. 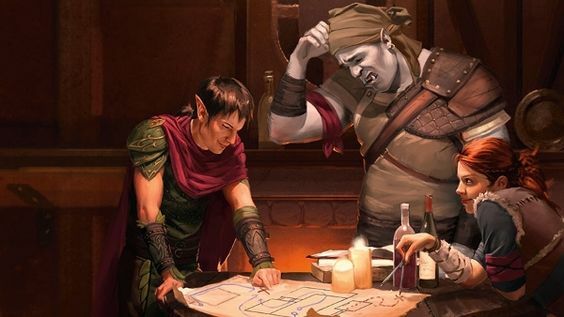 Each race’s description in this section includes information to help you roleplay a character of that race, including personality, physical appearance, features of society, and racial alignment tendencies. These details are suggestions to help you think about your character; adventurers can deviate widely from the norm for their race. Though, it’s worthwhile to consider why your character is different, as a helpful way to think about your character’s background and personality. Characters of most races are Medium, a size category including creatures that are roughly 4 to 8 feet tall. Members of a few races are Small (between 2 and 4 feet tall), which means that certain rules of the game affect them differently. The most important of these rules is that Small characters have trouble wielding heavy weapons, as explained in the Equipment section. Your speed determines how far you can move when traveling (“Adventuring”) and fighting (“Combat”). By virtue of your race, your character can speak, read, and write certain languages. For a full list see the Languages section. Some races have subraces. Members of a subrace have the traits of the parent race in addition to the traits specified for their subrace. Relationships among subraces vary significantly from race to race. For example, the moon elves and twilight elves live side-by-side in the Forest of Dreams serving in different roles within the same culture and families. However, the sun elves and scarlet elves were once one people who were divided over a great moral conflict and now live apart.